Burreed tuber (Sanleng)-Sparganium stoloniferum Buch.-Ham. Botanical Name: Sparganium stoloniferum Buch.-Ham. 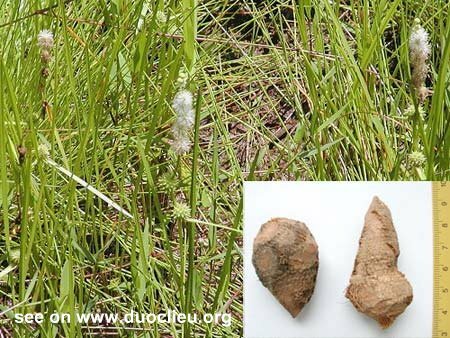 Common Name: Burreed tuber, Sparganium, Scirpus. Part Used & Method for Pharmaceutical Preparations: The rhizomes are dug in winter or spring. After the fibrous roots have been removed, the rhizomes are dried in the sun. 1. Qi and blood stagnation manifested as amenorrhea, abdominal pain and epigastric or abdominal masses. Burreed tuber (Sanleng) is used with Zedoary (Ezhu) in the formula Ezhu Wan. 2. Retention of food and qi stagnation manifested as epigastric and abdominal distension and pain. Burreed tuber (Sanleng) is used with Zedoary (Ezhu), Green tangerine peel (Qingpi) and Germinated barley (Maiya). Cautions & Contraindications: Prepared with vinegar can help the function of stopping pain. This herb is contraindicated during pregnancy and during profuse menstrual flow.